Dog poop is a problem we deal with on a daily basis. But is it dangerous? How much do you know? Is pet waste a health hazard? 1. Dog poop is NOT good fertilizer. It’s toxic to your lawn! The high nutrient concentration in dog poop will burn and discolor the grass, creating “hot spots”. 2. Nearly two decades ago, the Environmental Protection Agency (EPA) classified pet waste as a dangerous pollutant in the same category as toxic chemicals and oil. 3. You may not live near water, but unscooped poop from your yard is carried by overland water flow or is washed into storm drains, ending up in far away streams, rivers and ground water. 4. The U.S. Center for Disease Control and Prevention (CDC) confirms pet waste can spread parasites including hookworms, ringworms, tapeworms and Salmonella. When infected dog poop comes into contact with your lawn, the poop will eventually “disappear”, but the parasite eggs can linger for years! When a human or animal comes into contact with that soil through everyday activities like walking barefoot, gardening or playing, they risk infection from those eggs … even years after the poop is gone. 6. Dog poop often contains roundworm larvae, which cause blindness. If a human ingests a roundworm larva, it can migrate through the body causing disease to the brain, lungs, kidneys, liver, heart or eyes. So when people (especially children) touch soil, dog toys or anything that has been in contact with dog feces and then touch their mouths, they can become infected. Dog poop doesn’t just “wash away” or disappear. So if you’re not disposing of your dog’s waste, you’re putting yourself, your family, your dog and your water supply at risk. Have a poop free yard all the time! Scoopys is a neighborhood business and is SUPER AFFORDABLE! Weekly service is just $10. Daily pickup is $15 per week. 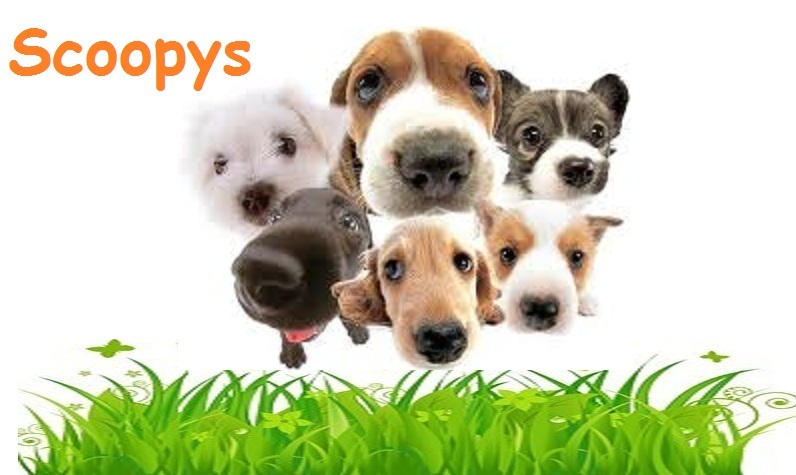 Scoopy Technicians come to your home with clean, sanitized equipment, take care of business, and then skidaddle, leaving you with clean, worry-free grass for your family and pets to enjoy! Not sure you’ll be home? That’s ok! Once your appointment is confirmed, our pickup technician will show up and do the job and leave an envelope at your house. You can put your money in the envelope and we’ll pick it up! Having a cute, tidy, poop free yard has never been easier!